One of the things that's important to me is striving to have less negative impact on the environment. I'm not perfect--nowhere near it--but I'm always trying to improve. 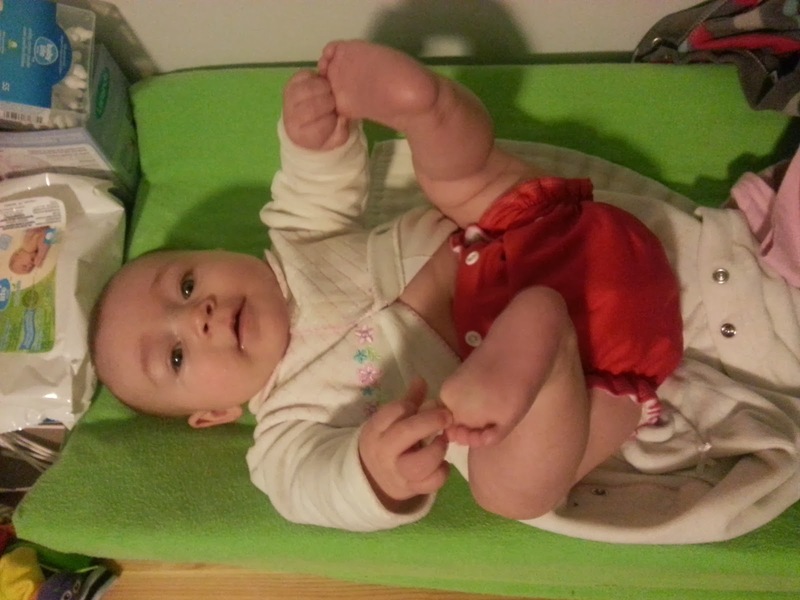 When I was pregnant with Linnaeus, it was a no-brainer that we were going to use cloth diapers. We signed up for a New & Green Newborn Diaper Rental Kit & had our son in cloth from his second day of life. I have to admit, using cloth diapers wasn't as easy as disposables. The extra laundry was sometimes a drag, the diaper bag was a bit bigger, as were the baby pants. Linnaeus has quite sensitive skin & we battled rashes of various kinds. But there are some great benefits to cloth--no chemical scents, no need to go on late-night diaper runs if you run out, huge savings over the nearly three years Linnaeus was in diapers. Cloth diapers are much cuter & soft on baby's skin. Fewer blowouts with runny newborn poo. When Linnaeus was out of diapers, I was happy to have a break from all the laundry & it was hilarious that he actually went down a size in his pants & shorts. I put away my stash of diapers, expecting to pull them out & start using them shortly after Brontë was born. When little B made her entrance, she had a big skin tag in her diaper area that we wanted to keep an eye on, so we went with disposables until that was resolved. Then the Great Breastfeeding Drama, Part II started & I made the choice to keep using disposables just to have one less thing to worry about. I put off pulling out the cloth stash for months, finding excuses like how unbelievably cheap disposables are at Costco. But five months in, I finally hauled out the stash. To my disappointment, the elastic was kaput on about a half dozen diapers. Oddly, it wasn't just the oldest ones, but one or two of the ones I'd most recently bought too. Luckily, this doesn't put much of a dent in the diaper supply because my stash was not only large enough before, but my sister gave me even more diapers since her kids are all toilet trained. The only catch--which was something that had been holding me back for months--was that I knew I'd need to strip the diapers to use them. About two years of use with Linnaeus & being washed in a machine that wasn't exactly funtioning optimally (it died on us about a year ago) means there's definitely some residue, making the diapers stinky & less absorbent. I did a 'test run', putting Brontë in the diapers my sister had given me, but after a couple of days of wondering, "What is that smell?" on & off, I realized that her diapers were in need of stripping too. So I went to my trusted online source of info & high-end diapers: New & Green. Poking around on the site, I found RLR Laundry treatment & ordered a few packets to try out. When they say fast shipping, they mean it. New & Green shipped out my order the same afternoon & the RLR arrived within 24 hours. I tried out a packet in with nearly every diaper we have. I ran the 'Super' wash setting on hot with the RLR, then ran another 'Super' wash afterward without any detergent to rinse it. I stopped the load in the final rinse to check that the water was clear--no suds--& then tossed it all in the dryer. Next was Brontë's turn: I put her in various diapers that I know were quite smelly due to ammonia accumulation over the next days. No smell at all. Even when totally soaked, they just smelled like damp fabric. Huzzah! It feels really good to be back in cloth. No more full garbage can, no more calculator app to figure out which brand of disposables are cheapest per diaper or deciding which size to buy. Next step: remembering to change her a bit more often, as my trim hemp inserts don't quite have the crazy absorption capacity that disposables have.